Rain and cool weather are limiting the availability of strawberries in many parts of southern Europe and the United States. This, combined with an increasing demand, is resulting in shortages on the market and rising prices. In California, the harvest has been affected by rain, which means that the picking has to be interrupted and there is no stable supply. Given that the season is in its final stages in Florida and Mexico, the result is scarcity. In Italy, the cool weather is causing volumes to be limited and prices have reached up to 10 Euro per kilo. The Spanish season is being marked by rainfall, clouds and low temperatures. These weather phenomena limit the harvest and drive prices up. Prices in Germany have also increased, especially ahead of Easter. The Israeli season is coming to a close in the coming months, but good volumes are still expected. The season is coming to a close, but growers still expect large volumes in the coming month. Weather permitting, the last strawberries will be on the market by June. The mild winter this year contributed to a large yield, which resulted in higher estimates. A period of warm weather could lead to a quick end of the season. The large supply goes hand in hand with relatively low prices for this time of the season. In supermarkets, strawberries cost between 2 and 3 Euro per kilo. These prices are comparable to last year's, but are below the average of the past 5 and 10 years. With average per capita consumption higher than in other OECD countries, demand is also good. The high demand, in combination with a short growing season, makes importing necessary during some periods of the year. Growers and authorities are working together to extend the season and increase the yield. Most strawberries are grown in tunnels or greenhouses, with a slow shift to greenhouse cultivation. Studies show that the best yields in the largest growing areas are achieved with table top cultivation in greenhouses. This method ensures a better quality and a higher yield, which is crucial for the fruit's lucrative, but limited exports. In the early season, it is possible to export to the United Kingdom, for example, as the British market has limited supplies from other countries during that period. In the best years, up to 1,000 tonnes are exported, with almost all strawberries intended for British supermarkets. By targeting a specific group among British consumers, high prices can be obtained, making it possible to cover the transport costs. The rainy weather in California is having an impact on the strawberry market. A grower says that the rain has led to losses and a small supply. In the Watsonville region, producers are trying to resume the harvest, but with the rain that is still expected, it is uncertain whether the process can start again. In the Oxnard region, the harvest is getting underway again after the bad weather, but rain is also expected there. When there is only a little bit of rainfall, the harvesting is still done, but if too much rain falls, it is necessary to stop. The first strawberries are also being harvested in Santa Maria. It will take a few weeks before large volumes from that region are available, predicts a grower. The rain also has consequences for the fruit's shipment. Due to the precipitation, the distances that strawberries can travel are limited. Traders respond to this by transporting the fruit over not too great distances. The demand for the product is good. "There is more demand than supply at the moment, because there are districts where the season is coming to a close, and they do not have a high enough quality to be able to deliver to retailers," says a trader. Due to the smaller volume of the new harvest in California, the demand is greater than the supply. The result of all these developments is reflected in the prices, which are higher. Growers in California are aiming to avoid a surplus in the short term. After a few seasons in a row in which the acreage has been reduced, this time the strawberry acreage has expanded by 9 to 10%. The decline was the result of the decision of growers in Huelva to diversify their crops with other soft fruits. The current season is marked by abundant rainfall, cloudy days and low temperatures. Due to these weather conditions, the volume has been considerably reduced, by an average of 20% so far compared to the previous campaign. Many growers have had to destroy part of the production due to problems with botrytis, caused by the high humidity in the greenhouses. The low temperatures protected the strawberries against further damage. Not surprisingly, the prices are higher than last year. Growers point out that they are facing less competition from other countries because of the bad weather in the whole of southern Europe, especially in Italy and France. The season in the northern European countries is expected to start later this year. This allows Spanish growers to extend their export season by shipping to these markets, before they switch to their own products. The weather in Huelva has improved, but the weather forecast predicts more rain in the coming weeks. The acreage has remained stable at 3,600 hectares. Basilicata and Campania are the largest production areas. In Campania, growers had protected the plants from the frost in February, but according to a trader, about 30% of the production was still lost. The harvest of the early strawberries kicked off at the end of March. Growers in Sardinia are looking forward to the season with optimism, especially now that the supply from Spain has been reduced. The season on the island started in December and will last until June. The harvest of the open field strawberries kicks off in early April. Despite the cool weather, the demand is good, resulting in a higher price. The demand is expected to remain high for a few days. In the first week of April, the price on the wholesale market rose to 10 Euro per kilo. At the beginning of the season, in February, the price stood at 2.50 Euro per kilo. If the production increases due to the warmer weather, prices will fall again. The export is mainly focused on the European market, with Germany, Austria and Switzerland as major customers. As for imports, it is also the European countries that supply the Italian market. Spain, Germany and France are the most important partners. According to a large player on the French market who almost exclusively grows greenhouse strawberries, there is not much demand for strawberries yet. This is because the weather is not ideal. There is not enough sun, and consumers do not feel like eating strawberries yet. In any case, the market is sustained by previously made agreements. The supply has slowed down considerably, but good volumes are now coming from south west France. This is especially true for elongated varieties, such as the Gariguette and the Ciflorette. The round strawberries have not really arrived yet. The outdoor temperature and humidity fluctuate a lot, and strawberries are very sensitive to these. The quality is therefore average. The consequences of the cold temperatures in southern Europe are also clearly noticeable in the German strawberry market. This, in combination with the high demand in the run-up to Easter, has caused prices to rise considerably in recent weeks. 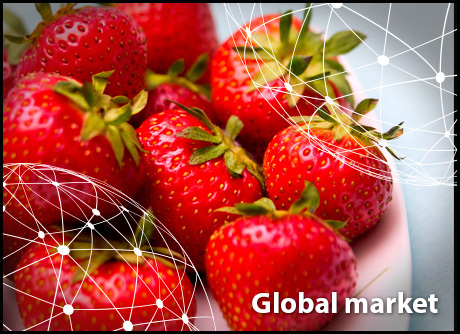 This applied not only to Spanish and Italian strawberries, but also to the Dutch greenhouse strawberries, which are currently traded mainly on German wholesale markets. Prices oscillating between 4 and 5 Euro per 500 grams (wholesale price) have not been rare in the past few days. Currently there are some interesting shifts going on in German trade. The Calinda variety is rapidly gaining ground and is also being imported in large volumes in Switzerland and Austria. As regards greenhouse cultivation, the share of the varieties Clery and Sonata is on the rise. Sustainable and environmentally-friendly packaging are very common in the German strawberry trade: cardboard boxes and wooden boxes are currently the norm. Recent statistics show that strawberries yielded the highest value (506.6 million dollar production value; 555.8 million dollar wholesale value) in the year up to June 2017. 91,083 tonnes of strawberries were harvested, with 13% of the total supplied to the processing industry. The volume increased by 26% and the value by 33%. Queensland is the most important growing area, accounting for 37.799 tonnes, or 41% of the total volume. Exports continue to rise and amounted to 3,881 tonnes in the 2016/2017 campaign. Singapore was the largest buyer, with a share of 24%. No strawberries were imported for the first time in recent years. Year-round cultivation is possible, as there are harvests in both the south and the north.